It's a new and fun way to connect and share your wifi networks with your friends and family. No more keeping long passwords on paper, or verbally spelling out the wifi password to the guests. Save time and headaches by downloading InstaWifi today. More than 1 million NFC-enabled Android smartphones are being shipped every week. We believe that NFC technology make lives simpler, and so InstaWifi uses NFC to instantly connect to wifi networks. 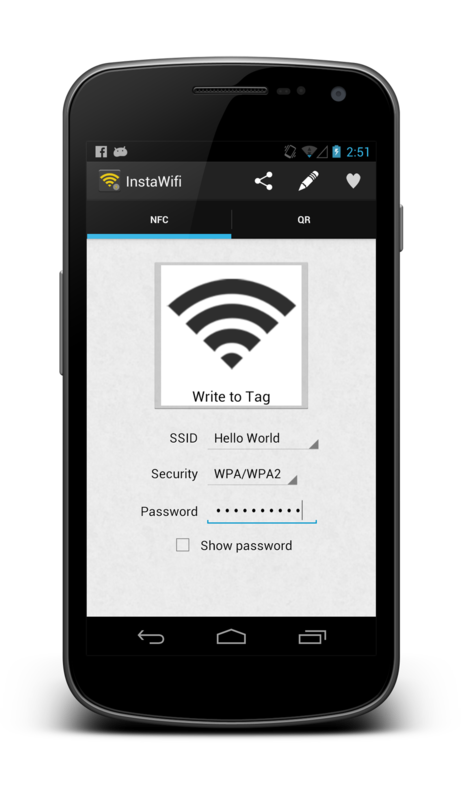 Write your wifi configuration once, and simply tap your phone to connect to your network instantly. For the 400+ million Android devices currently out there, QR codes are one of the fastest ways to perform an action. Create your own personalized QR code with your wifi network details, and print it out to share with your friends and family when they visit. InstaWifi will always be free so that everyone can use it. However, making a small donation to the developer is always appreciated. As a token of appreciation, we will send you Android-themed NFC stickers as a gift with no additional shipping costs (USA/Canada/Mexico only).